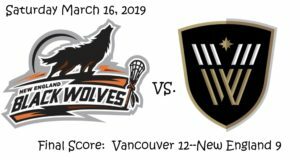 The Vancouver Warriors (4-8) hosted the New England Black Wolves (7-5) in front of 5,7­­­­69 fans at Rogers Arena Saturday in the fifth NLL game of the evening. Both teams sit in the fourth and final playoff spot in their respective divisions. The Black Wolves learned Friday night that MVP candidate Callum Crawford’s one-game suspension was upheld and to be served this game, and his looming four game suspension will go to arbitration. Without him in the lineup, recently acquired Joe Resetarits and Quinn Powless joined the left side of the offense. Vancouver, starting Eric Penney in net, overcame a hot New England start and held the visitor’s to just three second half goals to treat the fans to the team’s fourth win of the season. New England drops to 1-4 on the road, a troubling stat as the playoffs approach. Final Score: New England-9, Vancouver-12. From the opening faceoff, you could tell the effort from both teams was there. It was a playoff atmosphere in Vancouver as defenses were quick and tough. New England broke the scoreless tie 3:32 in as Joe Resetarits (1G, 2A) scored his first goal as a member of the Black Wolves. His isolation tactics were on full display as he sized up his defender from the left side and ripped the goal short side. Rookie of the Year candidate Dereck Downs (1G, 1A) made it 2-0 just over five minutes later. Vancouver got on the board with 4:40 remaining when Tony Malcolm (1G, 1A) scored unassisted in transition. New England responded with two more goals to take a 4-1 lead with under a minute remaining. Quinn Powless (2G) scored the first from the doorstep after a great feed from Resetarits; and Reilly O’Connor (3G, 2A) scored his first of the game with 47 seconds remaining. With the extra attacker on as the quarter dwindled away, Mitch Jones (4G, 2A) scored with three seconds on the clock to get the home team back within two. At the end of the first quarter, New England led Vancouver 4-2. Vancouver turned the tables early in the second quarter, scoring two straight to tie the game. Tyler Codron (1G) scored 4:38 in; and just 18 seconds later James Rahe (1G) scored unassisted to knot the game 4-4. New England’s Andrew Suitor (1G) broke the tie when the defender scored a dunk from behind the net almost five minutes later. On their second man down of the quarter, Vancouver got a shorthanded goal from Logan Schuss (1G, 3A) as he launched a rocket from outside. Powless answered just over a minute later with his second of the game to give the Black Wolves the lead again, but late penalties on New England gave Vancouver a power play opportunity to end the quarter. With the man advantage, Jones again found the back of the net late. Both teams had two power play opportunities in the quarter. New England went 0-2 and Vancouver went 1-2. At halftime, Vancouver and New England were tied 6-6. Stephen Leblanc (1G, 4A) gave New England the lead 1:03 into the second half, but it would be their last lead of the game. Vancouver answered with a three-goal run. Jones completed his hat trick with a shorthanded goal diving from behind the net 3:11 in. Over seven minutes of scoreless lacrosse followed before Keegan Bal (1G, 2A) gave the Warriors their first lead of the game unassisted on the powerplay. 30 seconds later, Jones scored his fourth of the game to put Vancouver up 9-7. O’Connor momentarily stopped the onslaught with his second goal, but Jordan McBride (2G, 1A) scored with 42 seconds remaining to get the lead back to two. At the end of the third quarter, Vancouver led New England 10-8. The fourth quarter in Vancouver had no penalties and only three goals. It took over 11 minutes for either offense to break through and it was McBride for his second goal in a row to give the home team an 11-8 lead. O’Connor’s hat trick goal with 2:48 remaining cut the lead to two, but the door was shut. Vancouver was content with stretching possessions and an empty net goal from Justin Salt with 1:25 remaining iced the game. Final Score: New England-9, Vancouver-12. The New England Black Wolves (7-5) travel to play the Philadelphia Wings (2-10) on Saturday, March 23 at 7:00 PM EST. The Vancouver Warriors (4-8) host the Colorado Mammoth (4-8) on Friday, March 22 at 10:00 PM EST.